When I was younger and slightly more ignorant, I thought tofu was gross because I was supposed to think it was gross. I never actually tried it until I was a young adult. 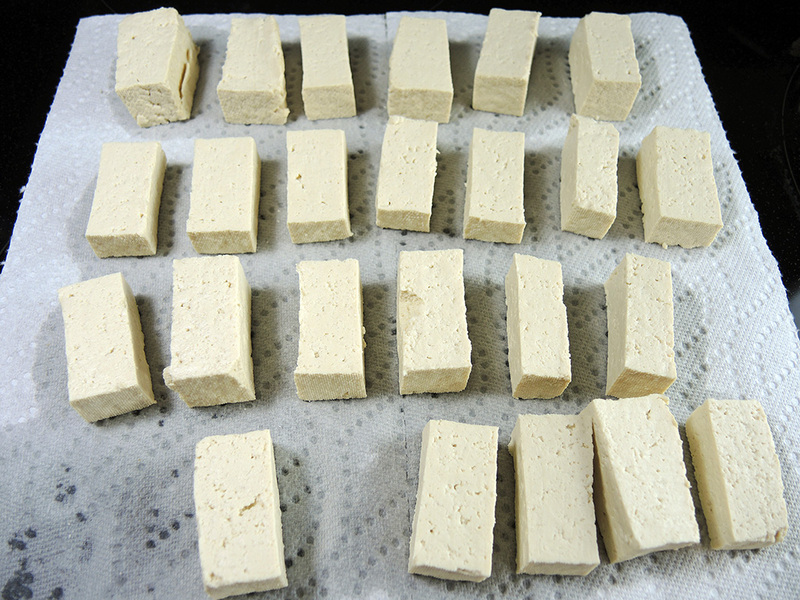 I then realized that not only was it versatile due to varying textures and preparation styles, but its mild earthy flavor allowed tofu to work with numerous flavor profiles. What really made me fall in love with tofu was the fried preparation. More specifically, the kind found in Thai restaurants or at my Vietnamese friend’s mother’s house. For those that have never tried tofu, the fried approach is a great way to get introduced to this Asian cultural staple. Those that love tofu will usually eat it not only fried, but baked, sautéed, stir fried, wrapped, crispy, soft, stuffed, sweet, sour, salty, and every preparation in between. This recipe is fairly simple and will produce mild or neutral tofu with a crispy outside and tender inside. When I say, “mild or neutral,” I don’t mean that as a negative term in this case. I mean that the tofu tastes like tofu without any added spices or other flavors. 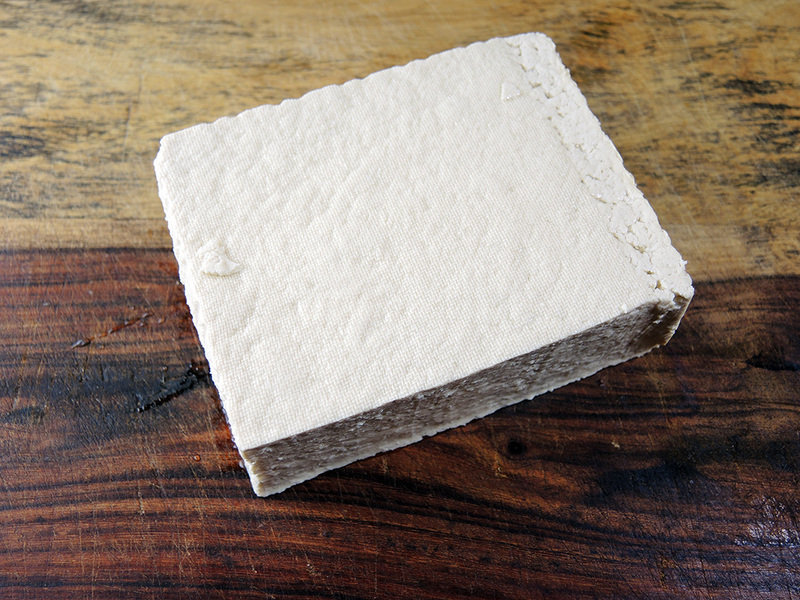 This is nice for those that just enjoy the simple flavor of tofu, but it is especially great for anyone interested in making a single batch of tofu that can be used any way you want after that. 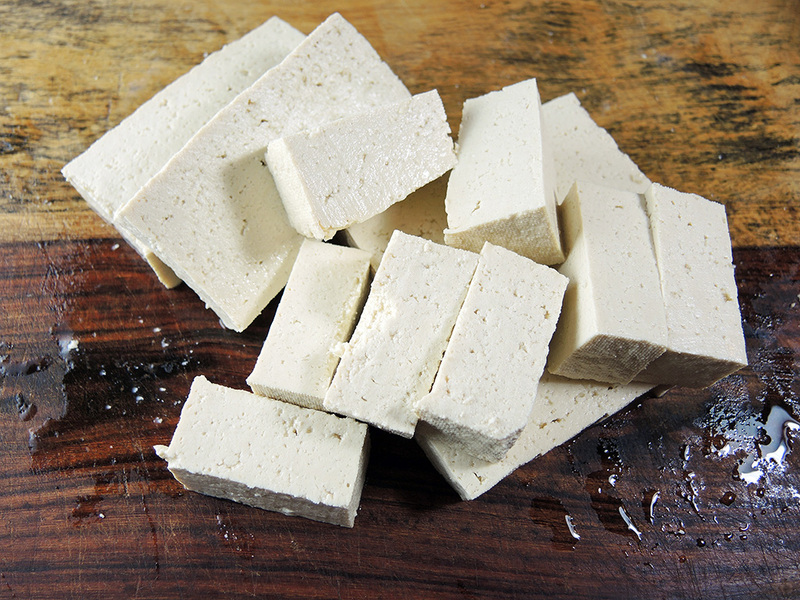 I’m loath to say the words, “meat substitute,” because nothing really substitutes for meat and tofu kind of stands on its own, but if you are so inclined, you could use this tofu for that purpose as well. I’ve included a recipe for a scallion and lemongrass topping that adds some zing to the tofu as a garnish, but this is only a suggestion. There is also a rough recipe for a light fish sauce that goes nicely with the tofu. 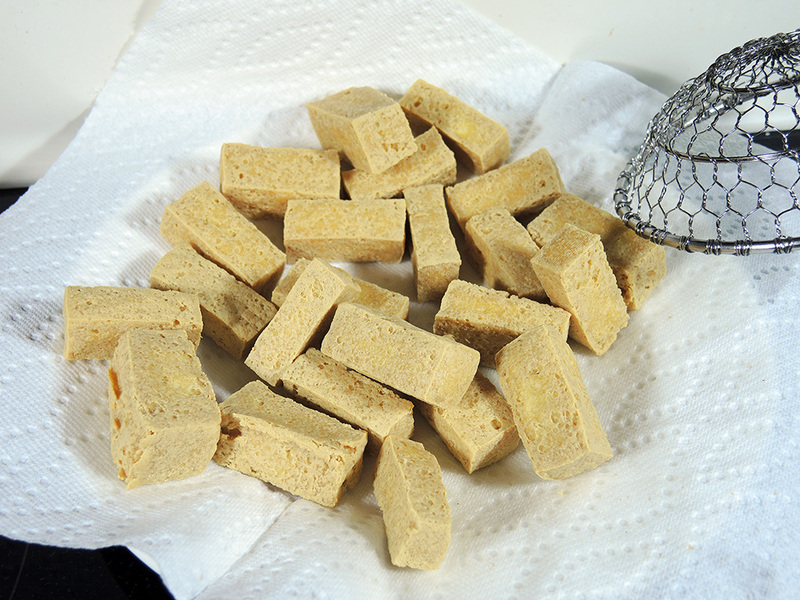 Makes about 24 large pieces of plain fried tofu at 35 calories each. Fried tofu with a sauteed scallion and lemongrass topping. 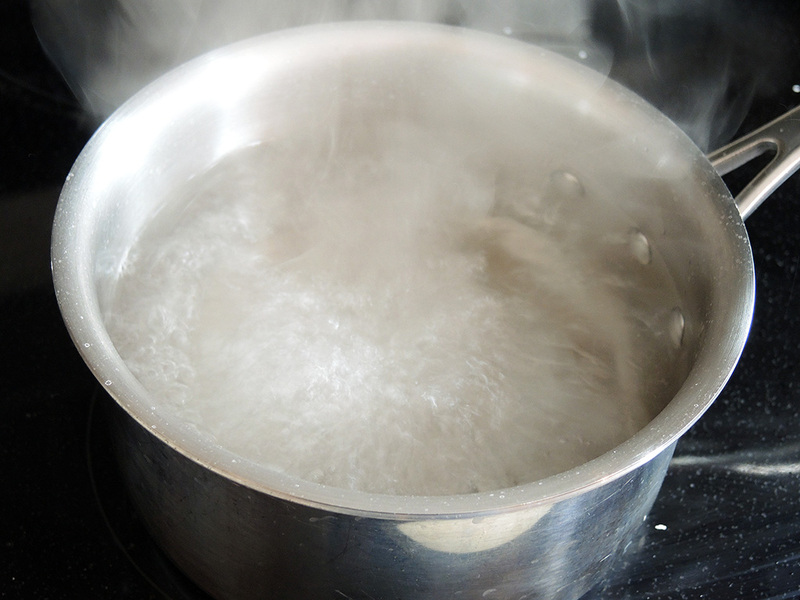 Fill a small to medium sauce pot with water and set it to boil on the stove. Once boiling add and dissolve about two tablespoons of salt to the water. You will use this water to pour it over the tofu to actually help draw out the moisture within. This technique (according to various sources) helps to tighten the tofu, which draws out moisture and the salt helps to add some flavor as well. While the water boils, open and drain the 14 oz. block of extra firm tofu. Carefully slice the block into equal pieces. You can make them into block or get fancy with triangles. Either way, I start by slicing the block along the shorter side before cutting those slices down into smaller blocks. 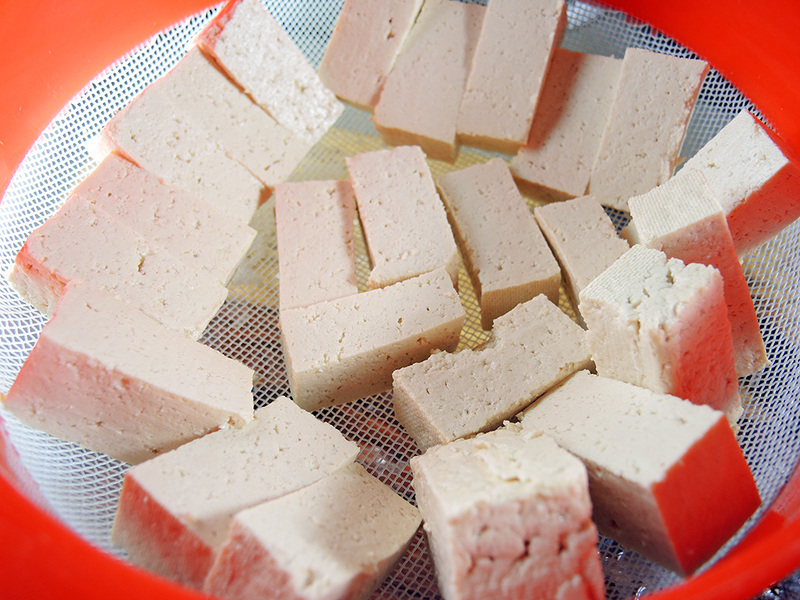 Place the tofu in a large colander or fine mesh strainer and make sure that the pieces aren’t overlapping one another. Hold or place the colander over the sink. Then, once the water is boiling, pour half the water over the tofu while making sure each piece is hit with water. After you’ve poured half the water over all the tofu, flip the pieces and pour the rest of the water over them. Let the tofu drain while you lay down a few pieces of paper towel down on a clean counter space. Line up the tofu on the paper tower to absorb the excess moisture. 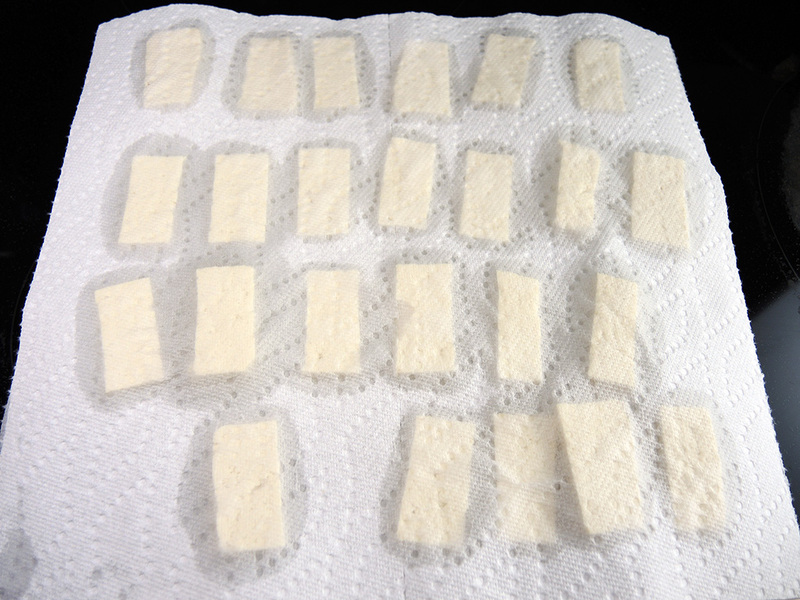 Cover the tofu with more paper towels and very gently press on the tofu to help the towels absorb more moisture. When the towels are soaked, you will need to repeat the paper towel process one or two more times to really absorb a lot of the water. Take your time with these steps because this is what really helps to crisp up the outside of the tofu. Perhaps more importantly, we all know that oil and water don’t mix, so drying the outside of the tofu also minimizes splattering oil when frying. You aren’t trying to completely dry out the tofu, but ideally when you press a paper towel to a piece, it doesn’t get soaked even if it gets a little damp. While the tofu dries, you can take that time to make the lemongrass and scallion topping as well as the fish sauce (see below for those recipes). When the tofu is ready, set about 1.5 to 2 cups of vegetable oil in a small or medium sauce pot (feel free to use the one you boiled the water in after drying it out very well). Set the stove to medium-high heat and get the oil hot. Ideally, you are trying to get it to 350 degrees F, but if you don’t have a thermometer you can wait until the oil starts to shimmer. Test to see if the oil is ready by dropping a small piece of tofu in or using the handle of a wooden spoon to dip in the oil. If either start to bubble a lot, the oil is ready. While the oil heats, lay down some paper towels on a large plate or heat-proof tray, which will hold the fried tofu and absorb excess oil. You can also use a cooling rack if that is easier for you. 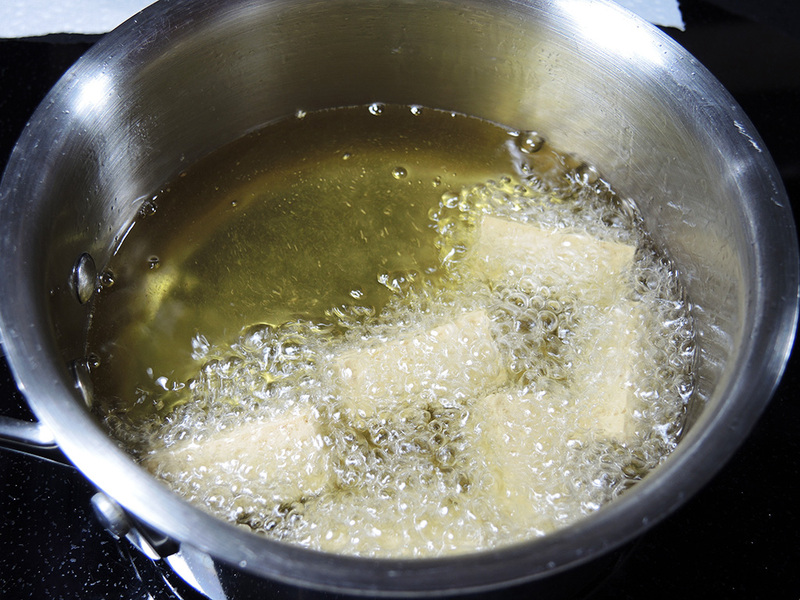 Using a slotted spoon, spatula, or Asian frying skimmer, carefully place a few pieces of tofu into the hot oil. You should have enough to fill about half the pot so that you have enough room to make sure they don’t touch and stick together. If they start to float together, just give them a tap with the spatula to separate them. You may also need to flip the tofu occasionally to make sure it cooks evenly. Once the tofu is a nice, deep golden color, remove it from the oil using the spatula and place the pieces on paper towels or a cooling rack. Repeat the frying process for all of the tofu pieces. The tofu is pretty much ready to serve just as it is. 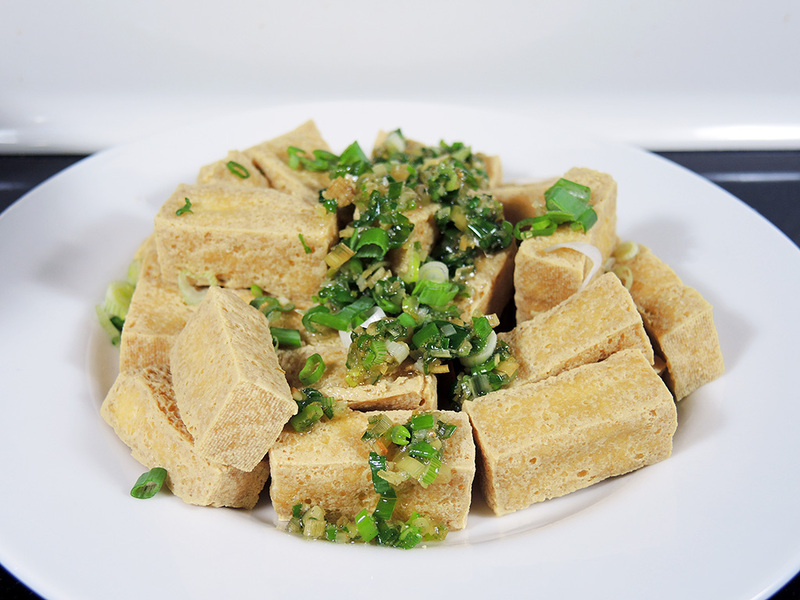 If you made the lemongrass and scallion topping, place the tofu on a plate and just scoop the topping over the tofu before serving. 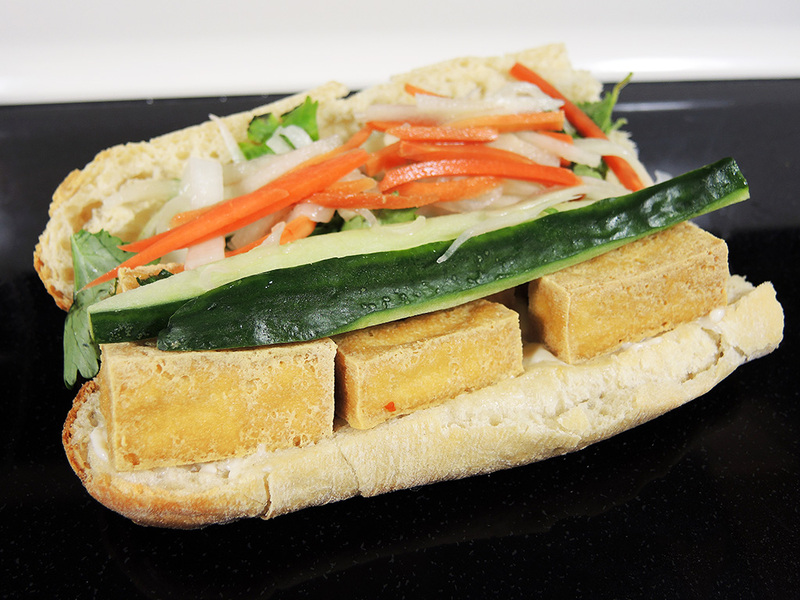 Eat the tofu plain, with the scallion lemongrass topping, dipped in fish sauce, or you could even use the tofu to make a tofu banh mi sandwich! The crispy, yet neutral flavor of the tofu is extremely versatile so you could use it many different ways in a lot of different dishes. You could even substitute this fried tofu for the baked tofu in my Baked Tofu Lettuce Wraps. I’d love to hear how you used your fried tofu! 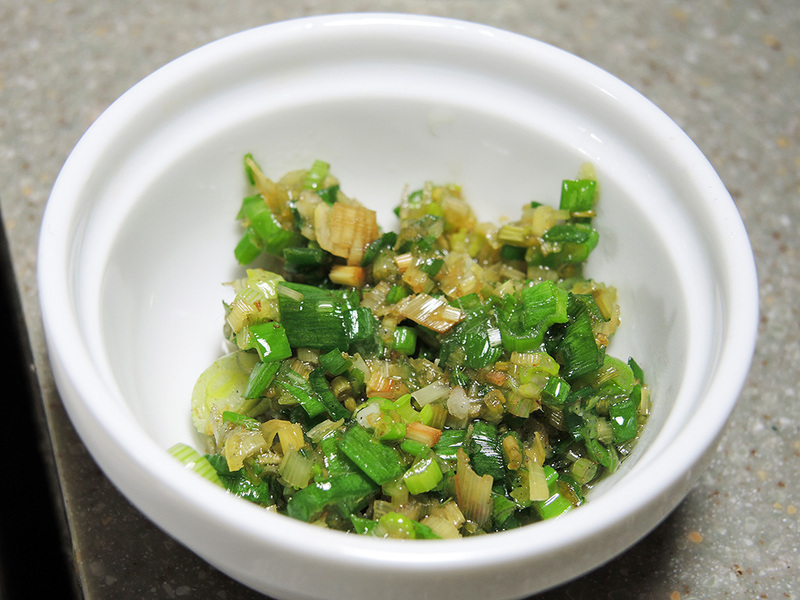 Dice up 1 tablespoon of lemongrass and 1 tablespoon of scallions. In a small frying pan, place 1 tablespoon of vegetable oil and heat it up over medium-high heat. 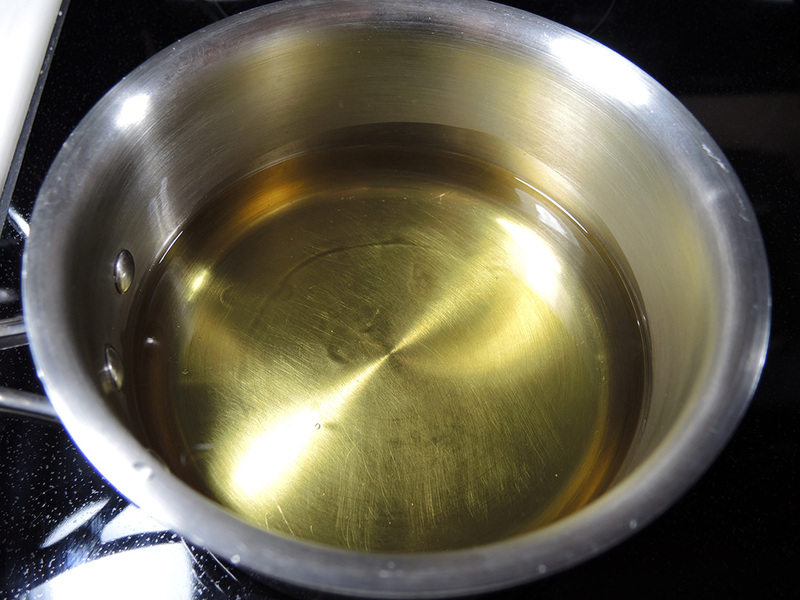 When the oil is warm add in the lemongrass and stir it well until it starts to release a nice lemony fragrance. Add in the scallions and stir all of the ingredients well until the scallions are just starting to get soft. Add the crushed garlic clove and stir quickly until golden, but not burned. Lastly, add in a teaspoon of sugar to the pan and stir everything until the sugar dissolves. Remove the topping to a small bowl until you are ready to use it. If the tofu is already prepared, just pour the topping over it. 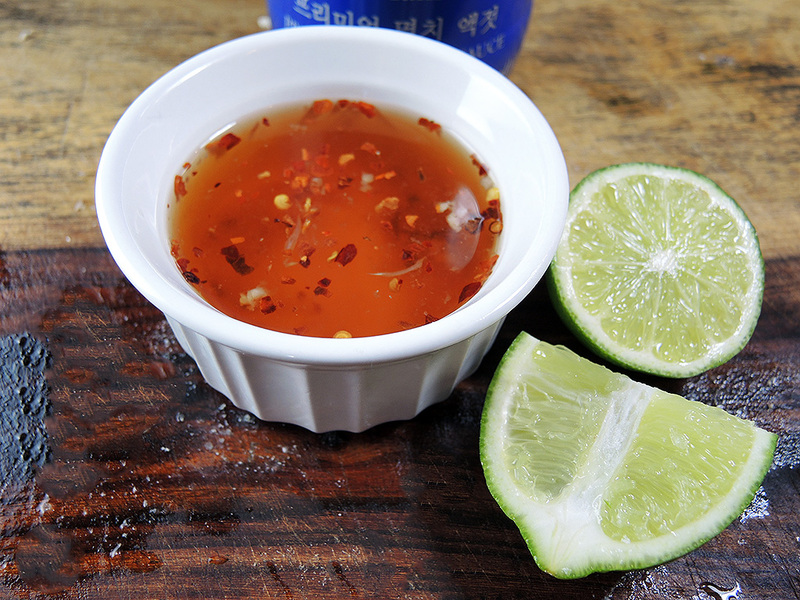 In a bowl or measuring cup mix the 3/4 cup of water, 1 tablespoon of fish sauce, juice from 1/4 lime, 1 teaspoon of sugar, 1/2 clove of crushed garlic, 1/8 teaspoon of red pepper flakes and mix together very well. Optionally, you can add some Asian pickled daikon and radish (not pictured) to the fish sauce.